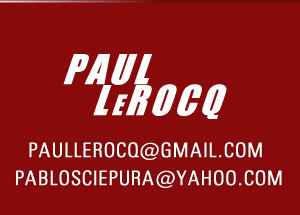 Multifaceted artist (Singer / composer - Screenplay Writer & Actor) Pablo Sciepura a.k.a Paul LeRocq was born on march 11 th 1978 in Quilmes, city of "Quilmes Rock Festival", Buenos Aires - Argentina. He began his first steps in music being the left handed guitarist in a highschool band, then he occasionally took classes but he managed to learn the instrument on his own practicing a lot. The same thing happened with piano. He also began taking singing lessons at the age of 24 for several years until becoming his own teacher. Besides singing in Spanish and English, he slowly started working with other languages, such as Italian and German in order to grow his repertoire variety and his artist skills. At the same age he started composing his own material in his native tongue and English as well, until reaching over 100 songs. He has produced his own recording sessions with Mr. Osi Tejerina, CEO of Digital Poley Records, in Buenos Aires - Argentina. 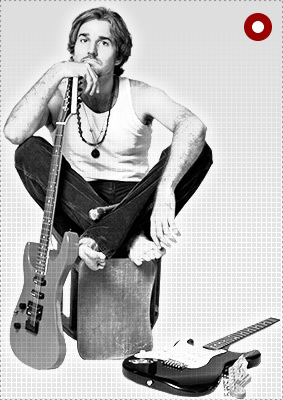 LeRocq has played in different bars / pubs in Buenos Aires, like Mitos Argentinos, Down Town Matías, Speed King, Montserrat, Barocho , John John, among others. But Paul felt his English music material deserved a chance abroad, so he began the harsh task of looking for music contacts in many different places, mainly in the US, Europe and Australia. With hard effort and investing many years developing his net of contacts, his initial goals were achieved, especially with radio stations and one particular company currently helping him out with worldwide radio promotion: Blue Pie Records, with offices in Australia and the US. His local efforts led him to sign a digital distribution agreement with Mr. Osi Tejerina in Buenos Aires. After years of sacrifice, perseverance and good music, Paul LeRocq keeps his beat on with rock´n punk n´ballads, new sound and the strength to carry on. At an early age, Paul also started developing a passion for writing not only music lyrics, but stories. During his adolescence, his first works were related to Spanish poetry depicting horror stories, that eventually became longer giving birth to his first scripts. With time, after studying English for more than ten years, he decided to implement this language in his writings. Gaining contacts abroad with movie production companies became a double task, including Latin countries and English-speaking territories, practically covering up the whole world from the US, to Europe and Australia as well. His genres vary from horror-suspense to action and comedies, always including a quote of dramatic touch in every tale told to make the audience and readers sweat out of nervousness. His idea about movie scripts relies on creating original and catchy stories, with twists and turns here and there to puzzle the viewers / readers while witnessing a fast-paced story, since Paul believes cinema equals entertainment. Besides his work behind the scene, LeRocq has studied acting for many years in his twenties, reason why being in front of the camera is another challenge he dares to accept when presenting his projects throughout the world.